Jehmaine Mark Edwards was born Dec 25, 1983, along with his twin brother, Jason Matthew Edwards and they were water head babies. The brothers were placed into foster care at the age of 13 months. Their biological mother was a teenager from England and she had no help. They were adopted by a religious, loving family. Their adopted father died of cancer on May 30, 1992. Jehmaine graduated from John Adams High School in Queens, New York. In 2001 the family moved to South Carolina. Jason was murdered July 29, 2006. The killer is still at large. Jehmaine deals with his grief by writing his thoughts on paper." If you are searching for poetry beyond the biggest imagination then you need not to search any more. In "Expressions of Thoughts"pt.2 Wisdom you will truly learn how to face the challenges of the world we live in today. You will gain insight, hope and inspiration that you too will make it through Christ who gives us all the right to live. The poems will enlighten you and some may take you deeper than you are expected to go. The only way you will know if you try it and see for yourself. Your soul and mind will be totally satisified. 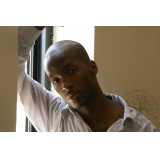 In this second collection of poetry from Jehmaine Edwards, who writes under the penname of wisdom, readers will explore the unique and challenging world the poet has faced. Much of the author's poetry is raw, presented in free form and relies on the dialect of the author himself. It is not the often cliché filled poetry of angst and loss that one finds so often at coffee house poetry readings. Readers will have the sense of sitting down with the author and discussing the very topics that he has faced in life. This technique is a powerful and proper one for this particular poet and his experiences. His poetry ranges from the life of experiences of feeling on top of the world in a poem like "A Star" to falling down to the depths of despair in a poem like "I'm Falling Apart". The wide-ranging emotions that the poet shares shows him to be more like all of us and his Expressions of Thoughts Pt 2 to be worthy of the experience.